Colorful white, yellow and orange candy corn are a fall icon. Even if you don’t enjoy eating these honey-flavored fondant pyramids, you can’t deny that they always brighten up a room with their vibrant colors. 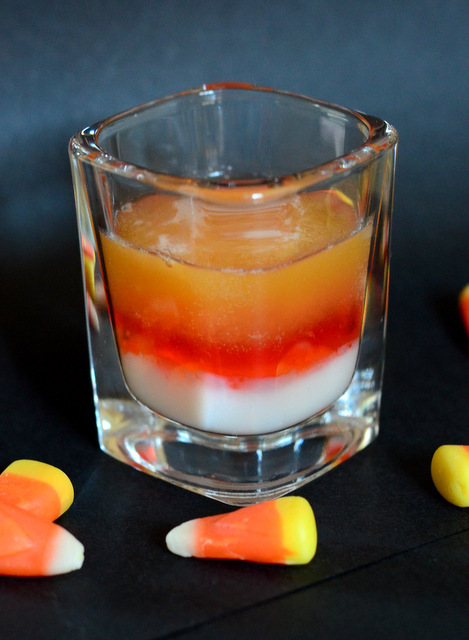 This year, I decided to celebrate the candy corn with some Candy Corn Shots. These are white, orange and yellow shooters that really capture the color of the candies that inspired them – no food coloring required. The list of ingredients may sound a little bit unusual for a shooter, and it’s definitely not a standard combination of flavors. That said, it is quite tasty even if it does taste nothing like actual candy corn. The white base is made with cream of coconut and lime juice, which cuts the sweetness of the creamy product (I like Coco Lopez) while still leaving it heavy enough to sit on the bottom of the shot. The orange layer is made with Campari and triple sec, which introduce some orange notes. Campari is quite strong and its bitterness will dominate the shot if you don’t balance it out a bit – and the two liqueurs have very similar specific gravities and blend together nicely without separating. The yellow top layer is apricot nectar (I used Kern’s), which has a perfectly creamy yellow color and a soft, fruity flavor that plays well with the other ingredients in the drink. It’s a little bit Tiki and a nice Halloween treat for you adult trick-or-treaters. To get the layered effect, simply place your bar spoon on the edge of the glass, near the surface of the previous layer. Carefully pour the next color onto the bar spoon, letting it run into the glass and create the next layer. You can increase the quantities given here, which are for just one shot, if you want to make a tray full for a party. 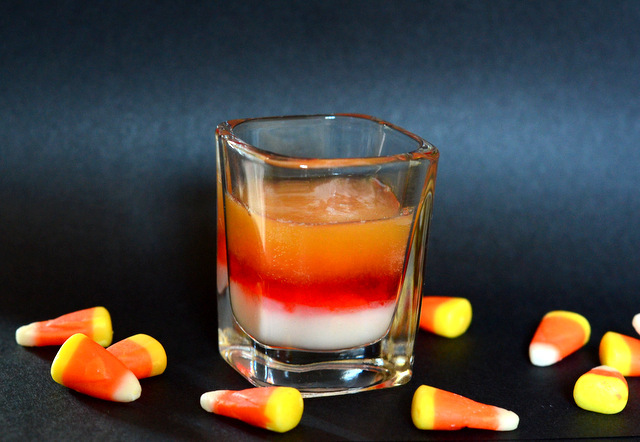 The shots have a nice citrus flavor, with a hint of coconut and a bittersweet orange finish from the Campari that will actually help cut through the sweetness of some of that Halloween candy and cleanse your palate for the next drink. In a small bowl or measuring cup, whisk together cream of coconut and lime juice. Pour into shot glass. In a small bowl or measuring cup, stir together triple sec and Campari. Place a bar spoon into your shot glass and rest it against the side of the glass, near the surface of the coconut layer. Carefully pour Campari mixture over the bar spoon and let it layer on top of the coconut. Repeat the same process with the apricot nectar to built the third layer. Handle finished shots carefully before serving.